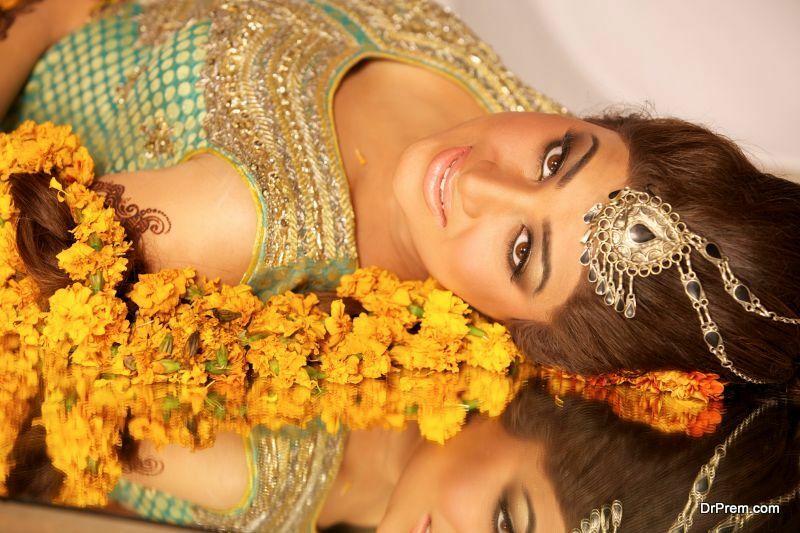 Indian wedding gowns are known for their artistic work, beautiful colors and delicate craftsmanship. There are various ways that you can trade your wedding outfit to make it look interesting and different. Here are some of the interesting ways of draping the dupatta (the long scarf that is worn in Indian attires) or the pallu (the part of the Indian saree that is draped over the shoulders). The elegant and classy look of this style will make your wedding gown look more beautiful. You can pin the dupatta/pallu on either side so that it does not fall off. Make sure that the borders are placed properly so that it is seen. If you want, you can also fold it into small plates and then pin it up leaving the rest to flow down. The neck wrap is a perfect way to go when you do not want to wear too much of heavy jewellery. This is a perfect style when you have nice embroidery work done on the sleeves that you want to show off. While draping this stylish look, make sure that you pay attention to the material. Free flowing and synthetic materials are the best options for such a drape. Net (if is soft) or even lace will work well. If you plan to wear a wedding lehnga and not a saree, then you can opt for the half saree look. This is an ideal option for people who are not comfortable with sarees. The half saree look is comfortable and easy to carry. A perfect option for anybody style, you can opt for the mermaid style of draping and carry it with ease. While choosing the embroidery design for this kind, ensure that there is a lot of work done on the pallu or dupatta. The mermaid look will give you a more suitable and definite shape. This is a modern day trend of the traditional way of wearing a saree. Net and chiffon are the perfect materials for this kind of draping style. The pallu/dupatta of this draping style should be thin. You can experiment as much as you want with your blouse. 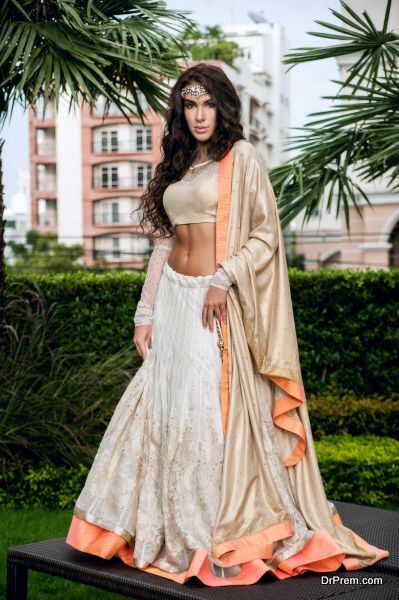 A new trend that has hit the market it the belted saree, in this trend, you can have a traditionally designed belt that you can place on your waistline. It is a good option when you do not want to have too much of work on your wedding gown, but still want to add the style element. Broad belts are the best way to go and replace the kamarban (waist chain) perfectly. You can always use this belt even after your wedding with any other attire. If you are more comfortable with pants or leggings, then you will defiantly love this style. You can choose to have a nice heavy dupatta with light embroidery on the pant. For the blouse, let the emphasis be more on the sleeves. This comfortable way of draping is ideal for girls who are not used to wearing sarees or want to have something that they can wear even later on. In this style, you can drape your saree pallu or dupatta the normal diagonal way and then from the back bring it front. This style is perfect when you have a one sided blouse and you want to emphasis on the pallu. Heavy bordered work is advisable for this style since it can be seen beautifully. What are the hair updo’s for bridesmaids?